Berlin (AFP) – Five-time European champions Bayern Munich must draw the consequences from their “very painful” 3-0 Champions league defeat by Paris Saint-Germain, according to the German club’s chairman Karl-Heinz Rummenigge. 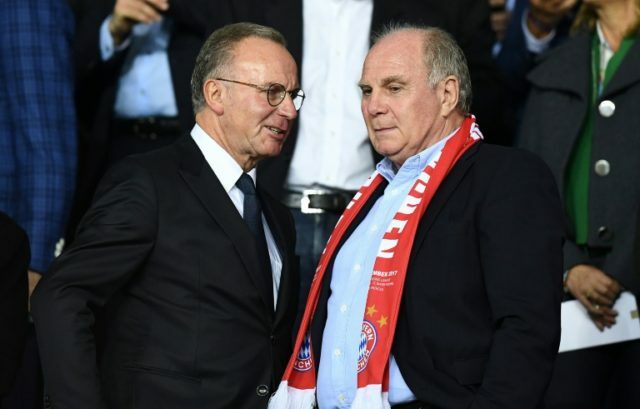 “It’s a very painful defeat, a defeat we have to analyse and after which we’ll have to talk about clearly and draw the consequences because what we saw was not Bayern Munich,” Rummenigge was quoted by AFP subsidiary SID as saying at the post-match meal in a Paris hotel. The result left the French club top of Group B with the maximum six points from two games, eight goals scored and none conceded. They are on course to win the section — Bayern are level on three points with Celtic, who won at Anderlecht. The Sport Bild newspaper reported that Bayern officials will assemble later Thursday for a crisis meeting, with coach Ancelotti fully in their crosshairs after the crushing loss, Bayern’s worse in 21 years of European competition. “A separation is no longer to be ruled out, the Bayern coach wavers,” said Sport Bild, not alone in its criticism of Ancelotti, who has previously coached Real Madrid, PSG, Chelsea, AC Milan and Juventus. “The Italian, so experienced, provoked stupefaction and irritation with his team line-up,” said Die Welt. Kicker football magazine said that “with his selection, Ancelotti took a big risk… he’s the big loser”. “I tried to put out the best possible team, and if I am criticised for that, I’ll accept it,” Ancelotti said post-match, with the likes of French star Franck Ribery and Dutch winger Arjen Robben left on the bench. Bayern players, however, opted to stay mum on Ancelotti’s team selection and instead deflect responsibility onto themselves. “I’ll not say anything on this subject,” Robben said of the starting XI that the much-travelled Italian coach chose to go with.